1. PERIOD: The Contest will be comprised of six (6) sub-promotions to be scheduled as follows: i) begins at 12:00am Eastern Time (ET) on May 1, 2013 and ends at 11:59pm ET on May 31, 2013 (“Sub-Promotion One”); ii) begins at12:00am ET on June 1, 2013 and ends at 11:59pm ET on June 30, 2013 (“Sub-Promotion Two”); iii) begins at 12:00am ET on July 1, 2013 and ends at 11:59pm ET on July 31, 2013 (“Sub-Promotion Three”); iv) begins at 12:00am ET on August 1, 2013 and ends at 11:59pm ET on August 31, 2013 (“Sub-Promotion Four”); v) begins at 12:00am ET on September 1, 2013 and ends at 11:59pm ET on September 30, 2013 (“Sub-Promotion Five”); vi) begins at 12:00am ET on October 1, 2013 and ends at 11:59pm ET on October 31, 2013 (“Sub-Promotion Six”) (together, the “Contest Period”). 2. ELIGIBILITY: The Contest is open only to legal residents of the fifty (50) United States, Washington D.C., and Canada (excluding residents of the Province of Quebec) who are of legal age of majority in their jurisdictions of residence (and at least eighteen (18) years of age in the U.S.) as of the date of entry with a valid e-mail address and Internet access as of April 1, 2013. Void in the Province of Quebec and where prohibited by law, rule or regulation.. Directors, employees, and the immediate family (spouse, parent, sibling, children, grandparent or grandchildren) and/or household members of individuals employed by Bigelow Tea, the YES Network and all of their respective parents, subsidiaries, affiliates, directors, officers, employees, advertising and promotional agencies, are ineligible to participate. 3. CONTESTANT ENTRY: Visit the YES Network homepage at yesnetwork.com or click through the link in the Contest email during the pertinent Sub-Contest Period and upload a photo pertaining to that month’s Sub-Promotion challenge. (See table below for Sub-Promotion details). Limit one (1) entry per person, per Sub-Promotion. (A Facebook profile may be required to enter.) This promotion is in no way sponsored, endorsed or administered by, or associated with, Facebook. Sponsor is not responsible for lost, late, ineligible, damaged or misdirected entries or any typographical or other errors in the entry postcards, printing of the offer, administration of the Contest or in the announcement of the prize. Incomplete entry forms will be considered void. The Potential Winner must comply with all terms and conditions of these Official Rules, and winning a prize is contingent upon fulfilling all requirements. The Potential Winner will be required to sign and return an Affidavit of Eligibility and Liability/Publicity Release within 24 hours of the date of notice in order to claim his/her prize and become an official winner (“Official Winner”). If a Potential Winner cannot be contacted, or fails to sign and return the Affidavit of Eligibility and Liability/Publicity Release within the required time period, the Potential Winner forfeits the Prize. In the event that a Potential Winner is disqualified for any reason, Sponsors will award the Prize to an alternate Potential Winner by random drawing from among all remaining eligible entries received. Odds of winning depend on the total number of eligible entries received during the Contest Period. FIRST PRIZE(S) (10): Twelve (12) First Prize winners (two (2) winners for each of the six (6) months of the Contest Period) will each receive the following: i) one (1) Bigelow tea basket (Approximate Retail Value (ARV) of each basket: $59.95. ); and ii) one (1) YES Network shirt (Approximate Retail Value (ARV) of each: $29.97. Total ARV of Contest Prizes: $1,079.04. Official Winner(s) will be responsible for all federal, state and local taxes and fees and other expenses associated with Prize receipt and/or use that are not expressly included in the Prize description. No cash or other substitution, assignment or transfer of any prizes permitted, except by Sponsors, who reserve the right to substitute Prize or prize component with cash or another prize of comparable or greater value. Sponsors are solely responsible for providing elements of Prize to Official Winner. 6. PRIZE RESTRICTIONS: All Prizes subject to availability. No substitution or cash equivalent of prize permitted, except at sole discretion of Sponsor. Sponsor may substitute a prize of equal or greater value. No prize transfers permitted, except at Sponsor’s discretion. Winner is solely responsible for any expenses and any other costs not described as part of the prize. Federal, state and local taxes are the responsibility of winners. 8. GENERAL CONDITIONS: Sponsor reserves the right to cancel or modify the Contest if fraud, technical failures or any other factor beyond Sponsor’s reasonable control impairs the integrity of the Contest, as determined by Sponsor in its sole discretion. In such event, Sponsor reserves the right to award the Prizes at random from among the eligible entries received up to the time of the impairment. Sponsor reserves the right in their sole discretion to disqualify any individual they find to be tampering with the entry process or the operation of the Contest or to be acting in violation of these Official Rules, or in an unsportsmanlike or disruptive manner. Any attempt by any person to deliberately damage any website or undermine the legitimate operation of the Contest is a violation of criminal and civil law, and, should such an attempt be made, Sponsor reserves the right to seek damages from any such person to the fullest extent permitted by law. Sponsor’s failure to enforce any term of these Official Rules shall not constitute a waiver of that provision. WINNERS AND ENTRANTS RELEASE, DISCHARGE, AND AGREE TO INDEMNIFY AND HOLD HARMLESS, THE YES NETWORK, FACEBOOK, AND THEIR RESPECTIVE DIRECTORS, OFFICERS, EMPLOYEES, PARENTS, SUBSIDIARIES, AFFILIATES, AGENTS AND REPRESENTATIVES FROM AND AGAINST ANY LIABILITY FOR ANY DAMAGES, INJURY OR LOSSES, TO ANY PERSON (INCLUDING DEATH), OR PROPERTY, OF ANY KIND RESULTING IN WHOLE OR IN PART, DIRECTLY OR INDIRECTLY FROM ACCEPTANCE, POSSESSION, MISUSE OR USE OF ANY PRIZE OR PARTICIPATION IN ANY CONTEST RELATED ACTIVITY OR PARTICIPATION IN THIS CONTEST. 9. RELEASE/LIMITS OF LIABILITY: By entering this Contest, each Entrant agrees to release and hold harmless Bigelow Tea, the YES Network, Facebook, their parents, affiliates, subsidiaries, officers, directors, shareholders, agents, employees and all others associated with the development and execution of this Contest from and against any losses, damages, rights, claim or cause of action of any kind arising, in whole or in part, directly or indirectly, out of participation in the Contest or resulting directly or indirectly, from acceptance, possession, use, or misuse of any Prize awarded in connection with the Contest, including without limitation personal injury, death, and/or property damage, as well as claims based on publicity rights, defamation, and/or invasion of privacy. 10. DISPUTES: Each Entrant agrees that: (i) any and all disputes, claims and causes of action arising out of or connected with this Promotion, or any prizes awarded, shall be resolved individually, without resort to any form of class action, and exclusively by the United States District Court for the District of New York or the appropriate New York State Court located in New York; (ii) any and all claims, judgments and awards shall be limited to actual out-of-pocket costs incurred, including costs associated with entering this Promotion but in no event attorneys' fees; and (iii) under no circumstances will entrants be permitted to obtain awards for and entrants hereby waive all rights to claim punitive, incidental and consequential damages and any other damages, other than for actual out-of-pocket expenses, and any and all rights to have damages multiplied or otherwise increased. SOME JURISDICTIONS DO NOT ALLOW THE LIMITATIONS OR EXCLUSION OF LIABILITY FOR INCIDENTAL OR CONSEQUENTIAL DAMAGES, SO THE ABOVE MAY NOT APPLY TO YOU. All issues and questions concerning the construction, validity, interpretation and enforceability of these Official Rules, or the rights and obligations of the entrant and Sponsor in connection with the Contest, shall be governed by, and construed in accordance with, the laws of the State of New York, without giving effect to any choice of law or conflict of law rules (whether of the State of New York or any other jurisdiction), which would cause the application of the laws of any jurisdiction other than the State of New York. 11. CONTEST SPONSOR(S): YES Network, 805 Third Ave, 30th Floor, New York, NY 10022. 12. WINNERS’ LIST: For the names of the Prize Winners or a copy of these Official Rules, please send a self-addressed, stamped envelope to: YES Network Photo Contest c/o YESNetwork.com, 805 Third Ave, 30th Floor, New York, NY 10022 by October 31, 2013. Hello MyYESNetwork.com bloggers. Starting later this week, My YES will launch a new design for its blog pages. The new look will not only be more appealing to the eye, but it will also allow readers and writers to incorporate such social networking platforms as Twitter and Facebook. Additionally, the blogs' headers have been increased to 960 x 96 pixels. So get your new headers ready and be ready to upload them when My YES unveils the new blog design later this week. 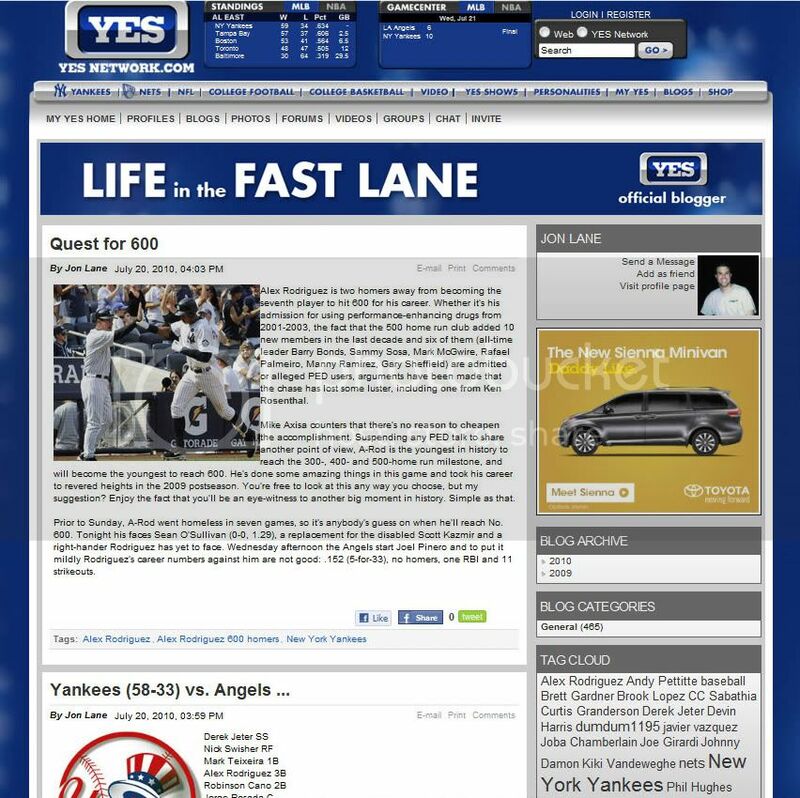 As we inch closer to this weekend's Subway Series between the Yankees and Mets, YESNetwork.com would like to know which moment from the epic New York rivalry is the greatest of all time. Here are your options, and remember to vote below. - 6/12/09: Luis Castillo drops a pop up in the bottom of the 9th, allowing Mark Teixeira to score from first for the Yankees win. - 6/28/09: Mariano Rivera records his 500th save and picks up his first RBI. - 7/8/00: Yankees and Mets compete in a dual-park doubleheader. In the second game, Roger Clemens hits Mike Piazza in the head with a pitch. - 10/21/00: First World Series game. Jose Vizcaino drives in Tino Martines in the bottom of the 12th for the walk-off win. - 10/22/00: World Series Game 2. Roger Clemens throws a bat shard at Mike Piazza. - 7/2/06: Yankees score 8 runs in the 3rd inning, including an A-Rod grand slam. - 7/10/99: Yankees hit 6 home runs, but still lose. - 6/27/04: Hideki Matsui hits a grand slam off Mike Stanton. - 10/26/00: Yankees clinch the World Series. - 6/27/04: Jeter hits two home runs. - 6/28/03: Hideki Matsui hits a grand slam off Jeremy Griffith. - 6/26/05: Jason Giambi hits a 2-run bases loaded single, giving the Yankees a 5-4 win. - 6/14/02: Jeter ties the game with a two-out hit in the top of the 9th (scoring Marcus Thames) and Robin Ventura wins it in the 11th with a 2-run home run. Where does this one rank? Tonight, following the Game 6 World Series victory by the New York Yankees, the National Baseball Hall of Fame and Museum collected the following artifact donations. The items will be featured in an exhibit to open in mid-November in Cooperstown and will remain on display through the 2010 postseason. The World Series case honors the present year champions in the Autumn Glory exhibit, which celebrates baseball's postseason. How should MLB use instant replay? Many My YES members think the umpiring performed in the ALCS is the worst they have ever seen. As a result, some are starting to think MLB needs instant replay on more than home runs. What do you think? Vote now. Within days of each other, My YES members Lola and ragamuffin have uploaded photos showing off both their gardening skills, as well as thier love for the Yankees. Which green thumb's yardwork do you like best? Lola's interlocking NY bush? Or ragamuffin's NY lawn? Vote now.